The foot broke off this 2,340 lb. 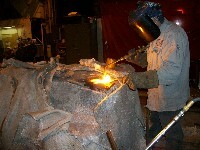 casting, which was then sent to Metal Surgery for repair. The foot broke off this casting making this casting change directions from the machine to the scrap pile. Metal Surgery received this casting and excavated, secured and then gas welded the foot back in place. 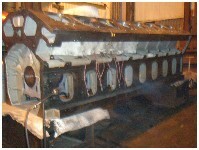 X-rays were taken and they showed zero defects in the weld zone helping this casting to a new life.